Hopefully by now you have heard the good word about Pi-Hole, set one up in a Docker container and now enjoying a substantially ad-less and speedy internet experience across all your devices. If you were one of the ones to configure your Pi-Hole at your routers end to have all the devices on your network use Pi-Hole then while 98% of the time this is enough, you may be surprised to learn that some off the shelf devices and/or software like to hardcode a DNS server of their choice. This means that even if your router is informing all clients via DHCP that they should use your Pi-Hole for DNS, they will be going around it and potentially leaking personal information or data you have chosen not to share. One such device that is common across households is the humble Google Chromecast. Now, I love my Chromecast. It’s a fantastic device to bring quick, simple and easy video streaming to anything with a HDMI input. That said, it has Google’s DNS servers hardcoded into the device and thus bypasses the Pi-Hole when making DNS queries. Hell, even one of the creators of the DNS system voiced his displeasure about the leaking of information that could conspire. iptables for the uninitiated is a Linux applications that allows you to configure the Linux kernel firewall via a table or tables of chains & rules. Essentially each network packet that transfers through the Linux kernel is sent through various chains of rules depending upon it’s origins to correctly route it to it’s destination. 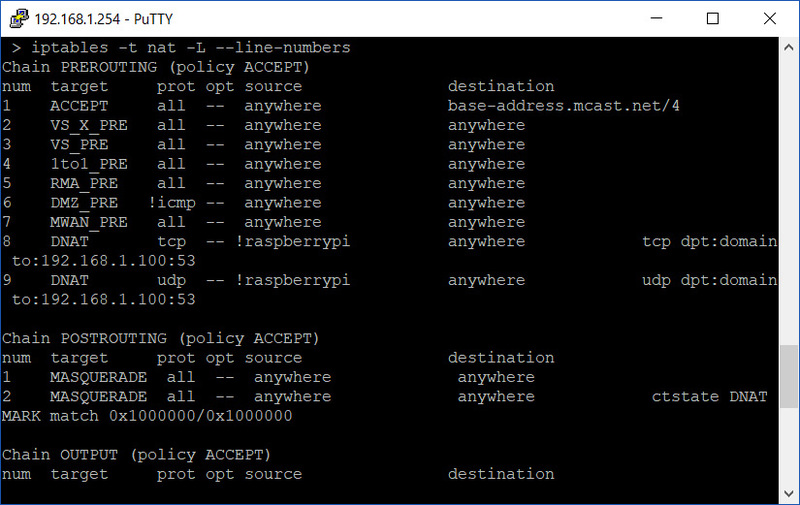 We will use iptables to ensure that all DNS query packets, no matter if they are explicitly configured to go around the Pi-Hole will be re-routed to the Pi-Hole for filtering or pass-through to our defined DNS provider. First off, SSH into your router and login to have administrative privileges. Take note of the current output of the PREROUTING chain. Replace piholeipaddress with the IP address of your Pi-Hole before entering. jump (move to the next chain) and destination NAT the packet to the Pi-Hole. There are almost limitless ways you could construct your rule but I found this is the most streamlined and efficient way to capture traffic that is attempting to go around the Pi-Hole for DNS lookups. Now we can see two DNAT rules under the PREROUTING chain. At this point, all DNS queries bound for port 53 attempting to exit your router will be redirected to your Pi-Hole and filtered if necessary. Happy days! But what do you do if you stuffed up the rule in iptables and now your internet is no longer functioning? We’ll discuss that in the next post. I have a SSH/iptables capable Linux distro ( LibreElec.tv, the Kodi JeOS) and I want to separate normal DNS queries from the couple going to geo unlocking proxies for Netflix, BBC iPlayer etc. otherwise route all traffic to Google/CloudFlare/OpenDNS as chosen. Of course one concern here is that a backup DNS server also need be specified e.g., for Google, both 8.8.8.8 and 8.8.4.4. Fantastic question. You got my creative gear engaged in thinking about the best way to meet your requirements. The second part of the question is easy enough. If you have two destinations you want to route to, the use of the statistics module is the most appropriate way to tackle that. I’ll cover that in an upcoming post. 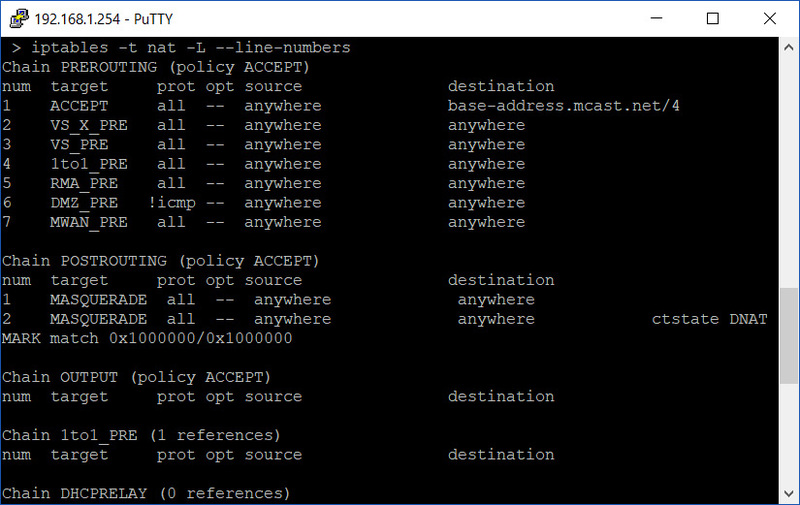 The first part with regards to forwarding the request based upon the destination is better served by a forward proxy and not iptables. As you are dealing in hostnames and not IPs and Ports, it’s not something IPTables caters for. What do you think of this simple hack from mgorven?